As I mentioned, my son passed his Technician and General license exams last weekend and is now KG5BYP. I told him that I would get him his own rig, so today we drove up to the Austin Amateur Radio Supply and got him a new Yaesu FT-1900R mobile unit. This is a simple, inexpensive little 2M mobile unit that does 55W and also has settings for 5W, 10W, and 25W (much more power, in other words, than the little handheld unit I have in my truck). He drives a 2004 Jeep Wrangler (Willys edition), so we spent about six hours after we got home installing it. The hardest part was figuring out where to put it. 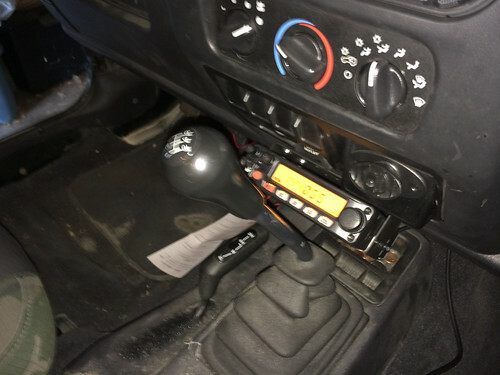 A lot of Googling helped us find some videos about taking out the center console on the Jeep; once we did that, it was a pretty simple matter to get the mount on the bottom, right in front of the stick shift (though it still has about 1.5” of clearance). The mount lets us adjust the tilt of the unit, and has plenty of clearance behind it for the cables and connectors. In addition, the heat sink is on the bottom, and this arrangement ensures that it’s got plenty of ventilation. 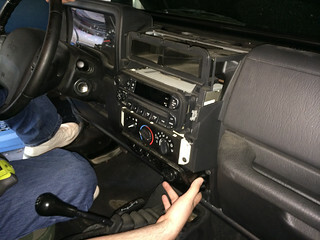 Once we got it mounted we found a hole through the firewall on the driver side and removed the rubber plug. 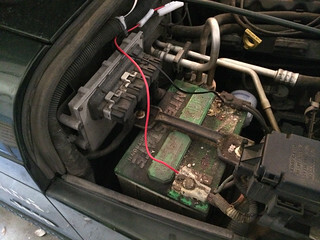 We pulled the power cables through and tied them directly to the battery. We tied everything down with cable ties and made it all clean and neat. Finally, we used a through-window mount antenna on the passenger side. Probably not the best choice for an antenna, but the only mounting method that we knew for certain would work. A test drive showed that it was working fine, so we tied down all the cables on the inside and patted ourselves on the back.